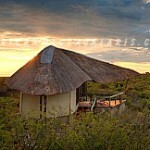 Tau Pan Camp accommodates up to eighteen guests in specially designed thatched units on raised decks. 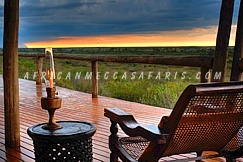 The camp offers truly incredible views from the ridge of an ancient sand dune, an unusual experience in a land as flat as Botswana, and overlooks the famous Tau Pan – recognized for its stark beauty and remoteness. 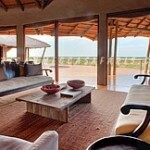 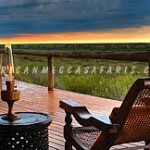 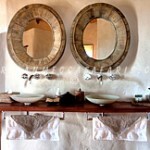 This, the first safari camp to be built in the Central Kalahari Game Reserve, is a model of environmental sensitivity. 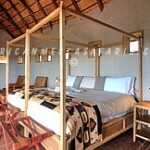 As with its sister camp, Nxai Pan, Tau Pan has been constructed with its delicate ecology in mind. 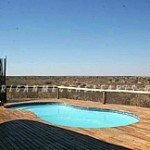 Both utilize only solar power for the generation of electricity, heating of water and pumping of water from deep under the Kalahari sands. 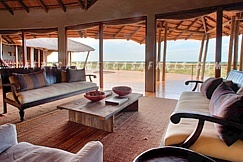 Waste water is treated in a state-of-the-art sewerage treatment plant and the fully treated water is returned to the sands from whence it came. 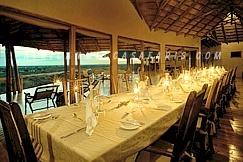 The camp is located in Central Kalahari Game Reserve. 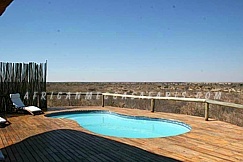 “Kalahari” is derived from the Tswana word Kgala meaning “great thirst” – and it has vast areas without any permanent water. 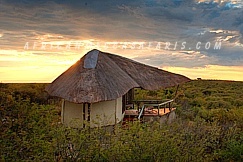 The term ‘desert,’ is however not quite accurate when referring to the Kalahari, the region receives an annual rainfall of 60mm-175mm, too high to be classified as a true desert. 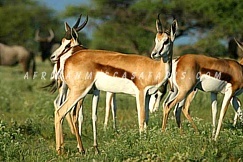 The Kalahari’s vegetation consists mainly of grasses and acacia’s, as well as stunted thorn and scrub bush. 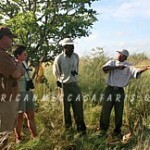 There are over 400 identified plant species present. 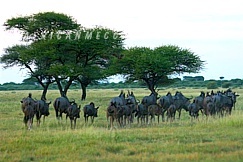 Annual rain season is between December and March when summer temperatures can get quite high. 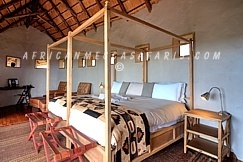 After the summer rains – the Central Kalahari Game Reserve completely transforms as the blue sky fills with huge clouds, and the plains and pans burst with sweet grasses. 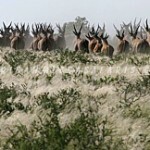 This is one of the best game viewing areas in Botswana at this time of year and not many people to seem to aware of this – so the visitors are few. 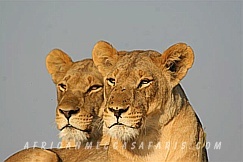 The dry season (May-September) is also a wonderful time to visit the Central Kalahari Game Reserve as the animals congregate close to any surface water and pans. 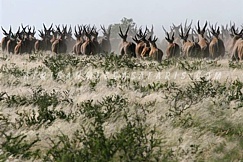 The Central Kalahari Game Reserve seasonally gets animals such as springbok, gemsbok and wildebeest in their thousands and is quite a sight to behold. 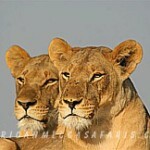 Predators abound with plentiful lions – especially the famous Kalahari black-maned lion, cheetah, leopard and jackals. 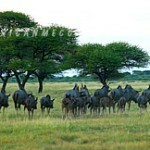 Brown hyenas and wild dogs are also found in the area. 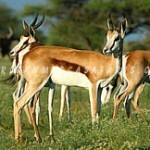 Several species of antelopes make the trip to the sweet grasses of the Central Kalahari Game Reserve which include the eland, springbok, steenbok, gemsbok, hartebeest, kudu and duiker. 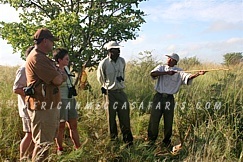 Honey badgers are regular visitors as well as ground squirrels and meerkats and many an hour can be wiled away watching these fascinating animals. 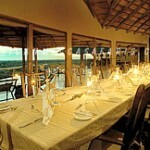 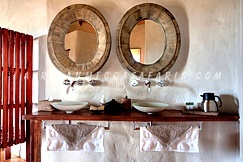 A recommended inclusion to any discerning Botswana itinerary.